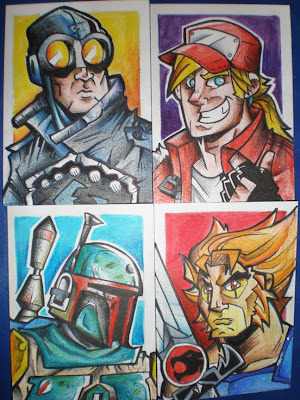 Well, the time has come to post the fourth and final sketchcard I did for this year's Comics for Cures, the BlueLinePro/Sketch Magazine Sketchcard Event for Cancer. I picked Lion-O, not only because of nostalgia but also because I realized I had never drawn him before. And who didn't love the Thundercats? Here are the inked lines. As before, I totally forgot to take a photo of the pencils only stage, but it didn't differ too much from this except that it was, you know, penciled and not inked. I didn't get too crazy with the drawing, so it was pretty simple and straightforward. Then, I started coloring the card with pencils. I used the same method for all four of the cards. The background was, like in the other cards, just a simple color. And know here are the cards all together! You might have seen them before on deviantart, but still, it's a first for this blog, so I hope you enjoy the set. 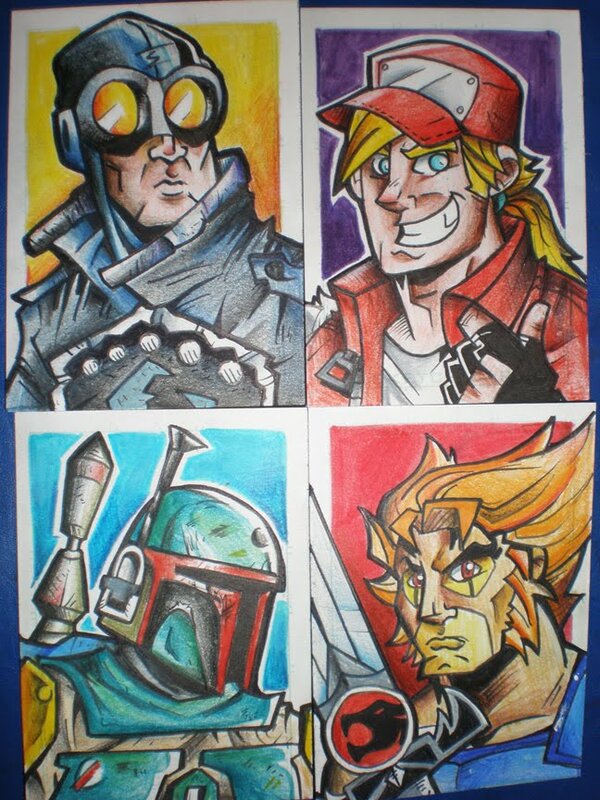 Sketchcards are really a ton of fun to make. I'd love to go a little crazier and be a bit more bold in the next ones. Hopefully I'll get to draw many more in the future. I'll let you know once these cards are up for auction! Its nice to see you colouring by hand and not using computer black magic!